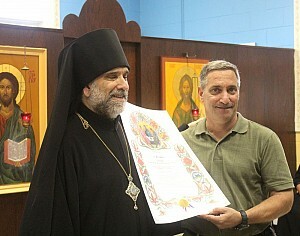 On Thursday evening, 26 July, during Great Vespers at Saint Andrew's Camp (Jewell NY) a long-time friend and dedicated volunteer of the camp, John Kozak, was presented with a gramota by Bishop Michael. His Grace recognized John for his tireless and selfless commitment to serving the camp and its youth, and for always putting the children, their safety, their growth in the faith, and their camp experience first. Pointing to John as an example and role-model, His Grace was able to impart to the campers the importance of ministering as faithful laypeople in Christ’s church. Joining His Grace, the campers, and staff were: Father Adam Sexton (Saint John the Baptist Church, Nanticoke PA), his wife, Angie and their children; Father Leonid and Matushka Laura Schmidt (Saints Peter & Paul Church, Syracuse NY); “Nurse Debbie;” and Paul Kondakoff, John’s close friend and a volunteer at Saint Andrew’s. The camp community concluded Great Vespers by venerating the relics of Saint Panteleimon “the Healer” and were anointed with oil from his reliquary. John was also presented with a framed poem and photo by camper Johnny P. (a long-time camper) as a remembrance of the time John Kozak shared his labors with the camp from 2004 to 2012. A special celebratory cake was prepared by Chef Stan Bilinski, which beautifully portrayed the look and feel of Saint Andrew’s Camp while offering celebratory congratulations to John ... one who labored much and was literally “a rock” of stability and support for the camp and campers for years. May God grant John Kozak “many years” and keep him in His loving care as he continues to minister in the church! There will never be anyone else quite like “Johnny,” as all who know and love him will attest, and he will be missed at Saint Andrew’s Camp.